Committee technology comes from Neural Network science application. The general idea is simple: we display several different projection lines upon one chart to see all possible variants of the forecast. Let us start with Annual cycle. I am able to download the price history for Dow from the year 1885 till now (2008). It is 123 years of price history. And we need to calculate the Annual cycle. But - there is a question: how much history is it better to use for the calculation of the Annual cycle? We may use all 123 years of price history. However, there is some opinion: we need to use only the last 5-6 years as the stock market in 1970s and the stock market now are totally different entities. Another opinion is to use 20 years of price history (20 years form so called Kuznets' cycle used by some economists). We can spend a lot of time discussing these and other options, and the truth will continue to be out there. 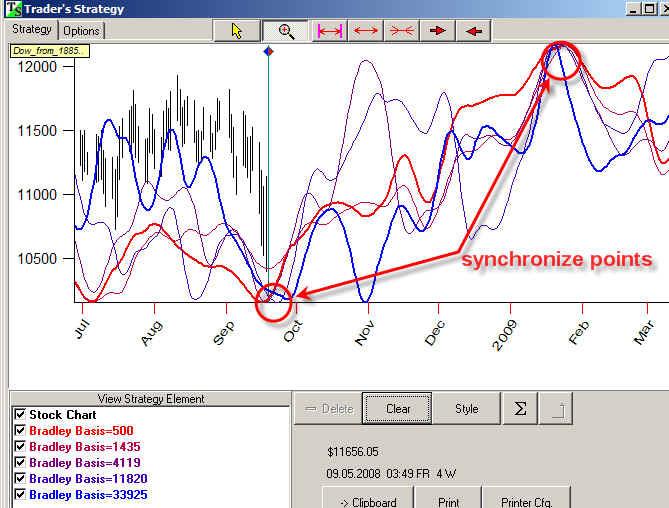 Timing Solution users are in better position here; they do not need to choose one option or another. They may run Committee feature instead. These 5 Annual cycles are based on different price history data. The red one uses the last year of price history while the blue one is based on all 123 years of price history. Looking at the forecast, we can say this: if the Annual cycle is calculated by using the last year or the last 42 months (almost 4 years) of price history, the Annual cycle points at the up trend movement in September (3 years up trend against one year's side). And if we watch the Annual cycles calculated for 12, 38 and 123 last years of history, we should acknowledge the existence of September drop. It worked for more than a hundred years though for some reason it did not work for the last 4 years. I think that in this year 2008 the stock market is back to its normal state, and its old pattern is back. 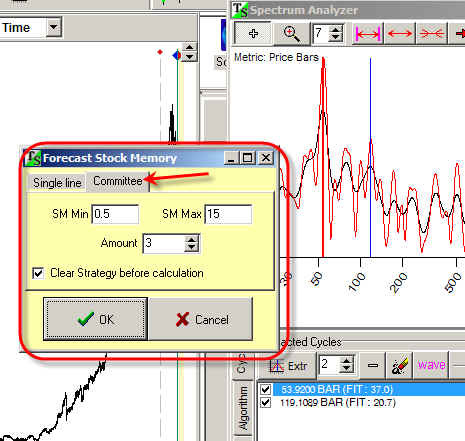 The committee approach can be applied for other forecast methods. 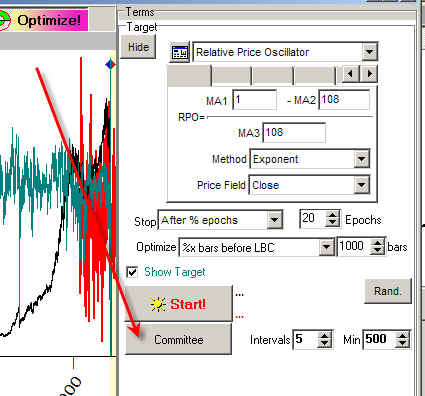 As an example, we can apply it to optimized Bradley Barometer (see the explanation here: http://www.timingsolution.com/TS/Mini/5_1/index_2.htm and http://www.timingsolution.com/TS/Mini/5_1/index_3.htm). In this case, we use different length of data to adjust the aspects' weights. We can adjust weights for the aspects using the last 2 years of price history (it makes 500 price bars for daily data) or we can use for that all available price history. These projection lines are based on different price history that has been taken into account: Red - 500 bars (2 years), the other one is for 1435 bars (about 6 years) etc. I would like you to pay attention to "synchronic" points when all projection lines indicate the same turning points. 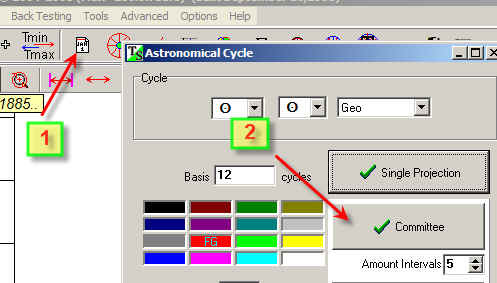 Here you can create either a single projection line based on calculated cycles ("Single line" tab) or you can calculate committee ("Committee" tab) which has several projection lines based on these cycles. 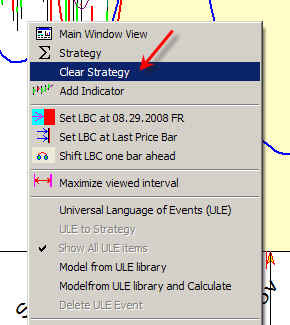 Remember that working with the committee, you actively use Strategy window (it is here ).